At Anime Expo 2017 this July 1 in Los Angeles, Kodansha Comics will present the world premiere of the Cardcaptor Sakura: Clear Card Prologue OVA, based on the newest work from manga supergroup CLAMP! Plus there will be a Q&A with the anime's producer Chiyo Kawazoe and special giveaways, exclusive to the screening. After the conflict with Eriol at the Tokyo Tower, Sakura attained the final Clow Cards: The Dark and The Light. Since then, everything’s gone back to normal––but only briefly. 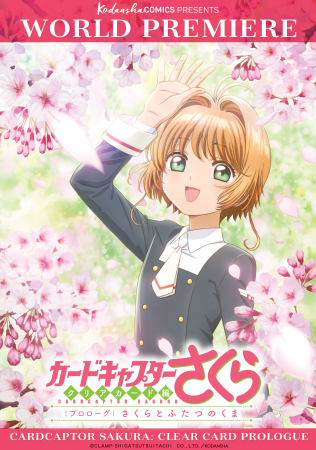 While Eriol has decided to move back to England, Syaoran suddenly confesses his true feeling for Sakura and tells her he is moving back to Hong Kong. What will Sakura do? Although she’s unsure of her own feelings, her best friend Tomoyo tells Sakura that the true answer already lies within her. That is when Sakura decides to make something for her dear friend. Be the first people on Earth to witness this prologue episode of the next generation of the Cardcaptor Sakura anime—coming soon as an OVA from Madhouse, the same studio who created the original TV series! The OVA doesn't make its debut until September 2017—but we are bringing this first glimpse of the anime to Anime Expo! Be seated early to get exclusive giveaways and a chance to win special prizes! o Time: 4:00 p.m. to 5:00 p.m.